EvThe KonMari method is very ~hip~ atm, and for all the right reasons. I read Marie Kondo’s book “The Life-Changing Magic of Tidying Up” so you don’t have to – here are the key takeaways on how to get your s*** in order! So I kind of feel bad because I’m sure all of you are tired of hearing me talk about decluttering by now, but it’s something I recently became low-key obsessed with so I’m just gonna ask that you guys humor me for a not-so-hot sec. I became ~inspired~ to start decluttering from my many hours of YouTube-watching… I was always so impressed with how these YouTubers could take their massive collections in makeup declutter videos and ruthlessly cut them down to be more much “normal”-sized. As someone who’s about to graduate soon and be launched into the “real world,” I’ve been reflecting a lot on my purchases and the fact that my makeup collection is a little bit ridiculous for someone like me who loves makeup and wants to have a career in marketing in the industry, but rarely ventures outside neutrals and isn’t a professional makeup artist in any way. Long story short… ya girl’s got a lot of makeup that she doesn’t need. I think the reason why I’ve accumulated so much stuff that I don’t use is because I have an issue with letting go. I’m the type of person who tells myself that I’ll use something “eventually,” so I keep it tucked away in some dark corner of my makeup drawer where it’ll ultimately be resigned to its fate of never seeing the sun again because I apparently can’t keep the promises I make to myself. I’m a self-flake. I’m worse than dandruff. In 2018, I vowed to stop this tomfoolery (yes I’m bringing this word back) and actually confront my massively impractical collection once and for all. I knew, however, that I was going to need a little help. Enter: Marie Kondo. I talked a little bit about this in my Makeup Resolutions post, but Marie Kondo is a Japanese organization consultant and basically a genius who came up with the KonMari Method, which is considered “a way of life and a state of mind that encourages cherishing the things that spark joy in people’s lives,” according to the website. The whole idea of the method is to “acknowledge” your belongings and “thank them for their service” before being let go if they no longer “spark joy.” At first, I was a little bit skeptical of this because tbh it sounds very cheesy to me… thank my items for their service before turning my back and never seeing them again? Still, I decided to give it a chance so I ordered her book, The Life-Changing Magic of Tidying Up: The Japanese Art of Decluttering and Organizing, and got to work reading listening to it. After finishing it, I realized that this idea of “thanking” my items before removing them from my collection made perfect sense – it put the issue of me holding onto things “just because” into perspective because it opened my eyes to the fact that owning an item and not using it is so much “crueler” than donating it/giving it to a friend who would get so much more use out of it. I realized that maybe that highlighter in my drawer that I never use would be much happier if it actually saw the light for once and that there would be “no hard feelings” for me letting it go. It honestly never occurred to me that makeup breakups could be mutual! Now, you might be looking at me like I have 20 eyes (or maybe just one, a la Mike Wizowski) for talking about my makeup as if my products have thoughts and feelings. I realize this is a little strange too, but honestly, it helps. When I “assign emotions” to things and think about what’s best for the bost of us, it really helps me to reflect and see that it’s so much better in most circumstances to just let go. As someone who likes to consider herself a rational person, this exercise of treating my products like they can feel things help me go through these steps and rationalize discarding them. The book isn’t actually that long – the audiobook is just under five hours and I found it super helpful, but here are the major takeaways that I personally got in case you don’t want to spend the time/energy/idk what else on the book yourself! Something really nice about this book is that it doesn’t sound condescending at all. I’m not sure if anybody else has ever thought this way, but I feel like a lot of the books I read that are “self-help” style come off as being a little judgemental, as if the author is looking down on me and telling me I need to get my act together, not fully understanding why I am the way I am. Like… yes, I know I need to get my act together. That’s why I’m here. In this book, Marie Kondo gives her own personal experiences. A lot of her advice comes from the fact that she was in our shoes not too long ago and came to these realizations on her own. She comes off as being a big sister or a caring friend, and I’m all here for that. I’d love to get brunch with Marie Kondo. Brunch aside (although LBR… brunch is always on my mind), one of her “personal experiences” comes from the fact that when she was younger, she used to be obsessed with storage solutions. She used to look at catalogs all the time in the quest of finding the “perfect” storage solution that would solve all her untidiness woes before she realized that no matter what kind of storage you find, storing items isn’t enough to completely organize your life. When I listened to this, a lightbulb went off in my head. It was like an epiphany moment because honestly… girl, she got me. I’m exactly the same way – I spend a lot of time on Amazon or the like scrolling through different acrylic makeup storage options or binge-watching makeup collection videos on YouTube just to see how beautubers are storing and organizing their massive collections. I also have spent a lot of time organizing and re-organizing my makeup in the past in an effort to make my makeup desk look neater, only for it to look just as messy the next day despite the hours I had just put into it. Marie Kondo telling me that storing things is only creating an “illusion” that clutter has been cleared really hit home because she was totally right. This is what got me to take the first step in tidying my life… decluttering. As I said before, I have an issue with holding onto things, so this is where I was really forced to look at myself and my things and ask myself if they really “spark joy,” which is what she uses as the threshold for discarding. If things spark joy, keep them, and if they don’t, thank them for their service and discard them. When doing this, I was very surprised at how many of my makeup products just didn’t spark joy in my life… and now it makes a lot of sense why I’ve been feeling so “weighed down” by my makeup collection. On another note, because I’m very extra, I couldn’t help but think of the song “I Could Never Rescue You” from The Last Five Years. Am I Jamie and all my makeup products are Cathy? Or is it the other way around? I guess we’ll never know. When you discard, Marie Kondo emphasizes the importance of laying everything out in front of you, taking each item in your hands, and asking yourself if it sparks joy. The reason for this is not only the fact that it forces you to confront the item and your own emotions about it, but that it’s just more practical so that nothing gets overlooked. Something else she says to do when discarding is categorizing items – she points out that a lot of times, people tend to discard by room or location, but because we tend to store different “categories” of items in different places, we run the risk of missing an item just because it wasn’t in the right place at the right time. I definitely can relate to this because I tend to only go through my makeup by where it’s stored – for example, I have a small plastic set of drawers on the top of one side of my desk that I routinely go through, while I never go into the larger set of drawers on the top of the other side of my desk, which means that it’s perpetually messy. Discarding based on category makes so much sense because it really forces you to look at EVERYTHING. And I mean everything. One of the more poignant parts of this book is when Marie Kondo talks about how people “fold” their socks incorrectly and how painful it is for her to see when she goes to the houses of her clients and looks inside their sock drawers because of the “disservice” we’re doing to our socks. This incorrect way that she’s referring to is people rolling their socks up together and folding them over so they look like a little “ball,” aka what I do. Ok, sis. Call me out, why dontcha? The reason she says this is a bad thing to do is that it stretches the elastic at the top of the socks, which is the reason why they tend to slouch. Like, yeah. She’s right, ok? This goes back to the whole “treating your items the way you would want to be treated” thing because at the end of the day, these items are “supporting” you and you, in turn, should treat them well. One way to do this is to fold them correctly, which not only prolongs their “life” as they’re less likely to get wrinkled or worn-out, but is also helpful for you because it allows you to see things better. I forced my friends to watch took my friends along with me as I attempted to re-fold all the items in one of my drawers, which was a complete mess beforehand. I wish I had the hindsight to take a picture of the “before” because it was a complete disaster – the drawer was completely full, I could never find anything, and I always had a hard time closing it because the corners of things would get caught in the drawer. Following Marie Kondo’s instructions and watching her demonstrate her basic folding method, I rolled my sleeve up, put on some music, and got to work. 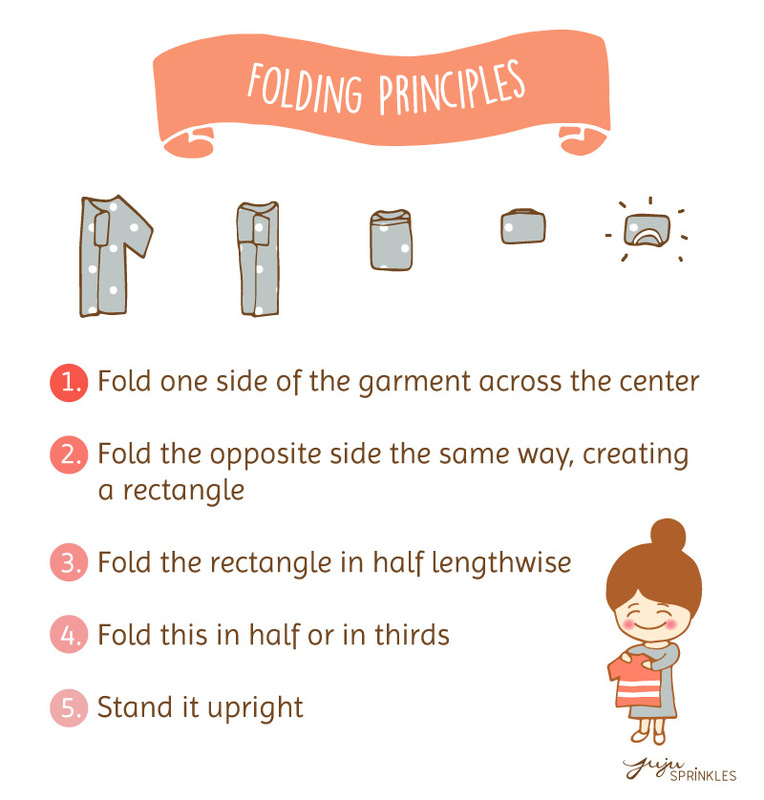 PS… if you’re more of a picture-learning-type person, I highly suggest this blog post on folding by Juju Sprinkles! Apparently, you’ll know you’ve folded things correctly when they can “stand up on their own,” which is not only damn poetic, but also takes a little getting used to. It took me a few tries before I got into the ~rhythm~ of it all and found that it didn’t take as long as I thought it would. The results were also amazing. Remember the drawer I couldn’t close? Take a look at the outcome above – I have SO much space and can actually see everything, like she said I would be able to. I trust Marie with my own life at this point. The results for the drawer above this drawer, which is where I store my socks and *hehe* unmentionables, are even more drastic, but I want to keep some shred of dignity so I’m not gonna show you that. At least not right now. Not only does this drawer function so much better now, but the fact that it looks more organized (because it is) really makes me feel happy. When I open the drawer, I’m not stressed out by the fact that it looks like a mess anymore, and I also feel kind of proud of myself for being able to accomplish this. Is that strange? Maybe. But I like it. Decluttering and organizing may seem like a ~super serious~ task, but it really isn’t, and it can actually be kind of fun. Marie Kondo makes a point to talk about how this whole process isn’t just to tidy up and clean your space, but a chance to reflect on yourself. For me, this was like yoga without the shaking, soreness, and constant reminder of just how not-flexible I am. I like the KonMari method because it’s not as rigid as my muscles in that Marie Kondo suggests certain ways to do things and where to start first, but I was able to take her “theories” and modify the “order” of doing things slightly to suit my needs. For example, she suggests starting the discarding with clothes because they’re the “easiest possession to part with” and leaving the sentimental items for last, but I felt a more pressing need to declutter my makeup first, so that’s what I did. I get the feeling that everybody’s “personal” order and preferences would also depend on who they are as a person – I find doing the most difficult things first the best for me because it makes everything else seem so much easier, but I can understand how some people prefer to “work up” to them instead. Additionally, Marie Kondo says that clothing is “the easiest to part with,” and while this may be true for most people, I know people – particularly in the fashion industry – who would definitely consider this the hardest. When I was discarding and folding, I had some fun music on (middle school party playlist ftw) and had my essential oil diffuser going because I’m #fauxzen and basically created a relaxing/fun space to do this in. It made the whole thing very therapeutic – again, yoga without the pain! All jokes aside, I seriously just feel so much better in general when I come home to a space that’s less cluttered and much more visually appealing to look at. The great thing about this is that unlike a diet, you see instant results – you can take before and after pictures in the span of an hour and see the difference. The fact that you possess a surplus of things that you can’t bring yourself to discard doesn’t mean you are taking good care of them. In fact, it is quite the opposite. By paring down to the volume that you can properly handle, you revitalise your relationship with your belongings. After my 2-year study abroad experience is over this summer and I return back to the US, I’m planning on going through my room and decluttering my entire makeup collection (because what I brought to Italy with me is shamefully only like 20% of what I really own), my books, and my clothes. I have a feeling my books are going to actually be the hardest thing for me to declutter, but I’ll cross that bridge when I get to it. After reading this book, I’m such a Marie Kondo stan. She’s relatable, very understanding, and again… everything she said was extremely true and while she did drag me a bit, it was the dragging I deserved. I wasn’t kidding about the brunch thing. I want to be Marie Kondo’s best friend.